Chill out knowing you're all protected. Schneider Electric™ spa pack ground fault circuit interrupters (GFI) for hot tubs, pools and spas is the last word in personal safety. Your pool or hot tub is a place for you to put your worries behind you and relax. 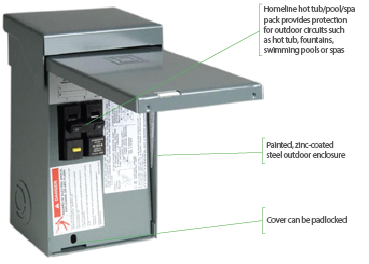 Ensuring that you have the right electrical components is paramount to your safety, and selecting a spa pack GFI for a hot tub, pool or spa has never been easier.Schneider Electric offers hot tub/pool/spa electrical protection, in outdoor rated enclosures. Produced either in robust steel or in a corrosion proof plastic, these enclosures were designed specifically to withstand the highs and lows of the Canadian weather. Our spa packs include a factory installed 50 A ground fault circuit interrupter. The 2-pole ground fault circuit interrupter provides ground fault, overload and overcurrent protection.So take some time out and relax, you deserve it. Selecting a spa pack loadcentre for a hit tub, pool or spa has never been easier. Hot Summer Pricing and options.